There’s nothing like a high school reunion to stir up a giant pot of memories. Moments with friends that still make me laugh with abandon. Dates that went awry. Romances that never got off the ground. The sting of old catfights. Misadventures and mishaps and misperceptions bubbling to the surface. I just returned from reconnecting with the Goretti Class of ‘82 down in Maryland where we roasted and toasted and laughed late into the night. Returning home to Vermont with a need to clear my head, I decided to try my hand at making chèvre in my kitchen. This may seem like an odd segue, but bear with me because there are some connections to be found. Chris and our daughters had given me a DIY cheesemaking kit a while back, knowing how much I had enjoyed volunteering at Crawford Family Farm. It had been sitting on my kitchen counter, awaiting the right time for me to delve in. All I needed was some fresh goat milk, which I found at the Middlebury Co-op. A quart of Polymeadows Farm and Creamery goat milk would yield more than enough cheese to fill the two molds that came with the kit. My family got the kit from Williams-Sonoma, but you can make the chèvre on your own without a kit; you’ll just need cheesecloth, a cooking thermometer, citric acid, and salt. If you don’t have molds, you can eat the cheese free-form or shape it into balls or a patty. It’s a good idea to sterilize everything beforehand by boiling in water for five minutes. To get started, I put a quarter cup of water in a small bowl and stirred in a half teaspoon of citric acid. While that dissolved, I poured the goat milk into a large pot. (You shouldn’t use an aluminum or cast-iron pot or utensils since they’ll react with the acid.) Warming the milk over medium heat, I stirred it with a slotted spoon every few minutes to prevent it from scorching. The milk gradually foamed and bubbled, a tangy steam rising from the pot. Memories are a mysterious thing. During a few enlightening conversations over the course of the weekend, I learned that my memories of particular events, some of them significant to me, were completely different from those of the other person who was involved. Or I only knew part of the story, back when an event occurred, and now I realize how much I was misperceiving. Or how much was misperceived about me. Even though these experiences happened thirty or more years ago, and I haven’t thought about them much in recent years, they came rushing back with a vividness that was startling. Stirring the pot, I checked the temperature as the milk heated up, aiming for 195 degrees Fahrenheit. When this was reached, I reduced the heat to low and poured in the citric acid solution. Immediately curds began to form. Stirring gently, to avoid breaking up the curds, I cooked the milk (or was it now cheese?) for thirty more seconds. Then I removed it from the heat to let it stand. The timing was perfect because I needed to pick my younger daughter Faye up from soccer practice. She’s in ninth grade and reminds me of myself at that age in a lot of ways. Her friends remind me of my old friends and many of the dramas are familiar. Most of high school still lies ahead of her, and my hope is to guide her well as she navigates the rocky trail. Back at home, I checked on the cheese. It had been standing about ten minutes, and there was a clear separation between the curds and whey. I could see the white curds settled at the bottom of the pot, covered by watery, yellowish whey. After lining a colander with cheesecloth, I poured in the curds and whey and let them drain for about ten minutes in the sink. Then I sprinkled in a half teaspoon of salt, gently mixing it in before letting the curds drain some more. At this point, I took a taste. The cheese was mildly goaty, as the milk had been. I added a little more salt to bump up the flavor a bit. Working over a bowl, I spooned the cheese into the molds, compressing it to squeeze air and excess whey out of the perforations so I’d end up with a firmer cheese. I drained them at room temperature for ten minutes and then in the refrigerator overnight. The next day, I slipped the cheese from their molds and carefully rolled them in herbes de Provence. For a little color and complexity, I added lavender to the mix. The recipe calls for the herbs to be mixed into the cheese before it goes into the molds, but I preferred coating the wheels instead. They turned out pretty well, and the whole process was less complicated than I expected it to be. Like a lot of things in life, I suppose. As I savored the creamy chèvre, I thought, Class of ‘82, we’re a lot like this cheese: we’ve all undergone transformations over the years, some more profound than others, but at our essence we’re still the same people we always were, just better. Like the milk turned into cheese, we’re improved, more intensified versions of ourselves. And, thanks to the wisdom of years, all of us are now more appreciative of each other’s nuances. Here’s to you, my dear friends, until we meet again. Pour the water into a small bowl and stir in the citric acid. Let stand until dissolved. Pour the goat milk into a large pot and heat over medium, gently stirring with a slotted spoon every few minutes until the milk is foamy and reaches 195 degrees F.
Reduce heat to low and pour in the citric acid solution. Cook, stirring gently, for 30 seconds. Remove the pot from the heat and let stand about ten minutes, until you see a clear separation between the curds and whey. The whey should be creamy yellow; if it still looks like milk, sprinkle in a bit more citric acid and stir to distribute. Line a colander with cheesecloth and pour in the contents of the pot. Drain about ten minutes, until the curds look like wet oatmeal. Sprinkle in salt and stir gently. Let drain about five more minutes, until the curds are the consistency of mashed potatoes. Place two small cheese molds (approximately six ounces each) in a flat-bottomed  bowl  and spoon in some curds, filling to one-half full. Press gently with the back of a spoon to compress and then fill to the top. Compress again and then let drain at room temperature for ten minutes. Cover the bowl with plastic wrap and drain the cheeses in the refrigerator overnight. Unmold the cheeses onto a plate. 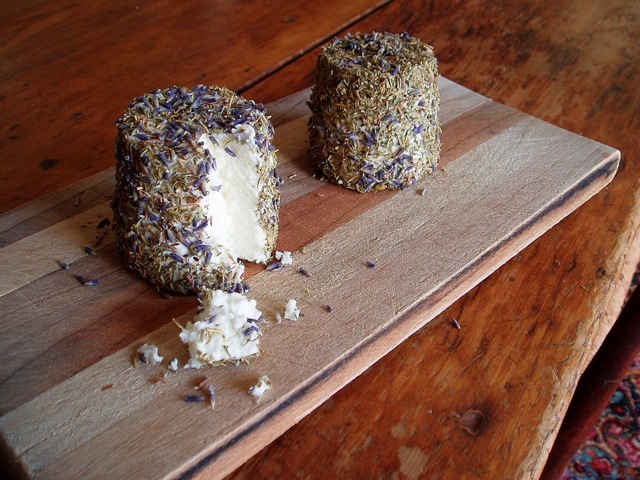 Place herbs in a small bowl and carefully roll each cheese wheel in the herbs, coating all areas.